Summary: The climate always changes, with or without our intervention. The political struggle over climate-related public policy has left much of America not only vulnerable to anthropogenic extreme climate change, but also to normal climate variations. Another in our series about how America sees the world, and prepares for change. The climate has changed endlessly since the day the Earth was born, and will until the day it dies. 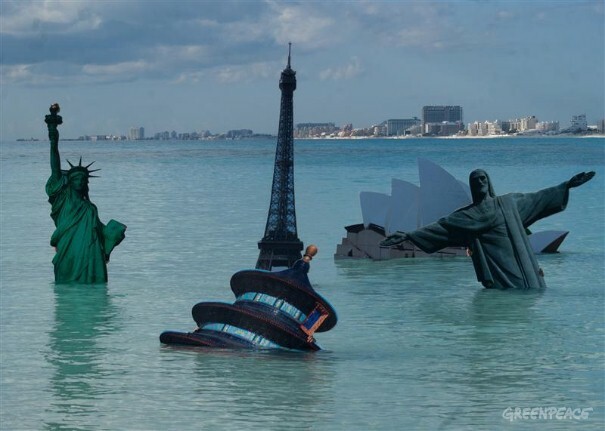 Alarmists advocate radical public policy changes changes in the hopeless quest to freeze the world’s climate in its status quo (quite different than the advice of the IPCC and major climate agencies). While the Left and Right quarrel over equally specious visions of the future, we make inadequate preparations for the inevitable. We build cities in the Southwest, ignoring the region’s history of mega-droughts. We build suburbs on fragile Atlantic barrier islands, sand bars destined to be swept away by storms. And, the subject of today’s post, cities like New York and New Orleans lie like sleeping dogs on the highway, to be wrecked by quite ordinary storms. 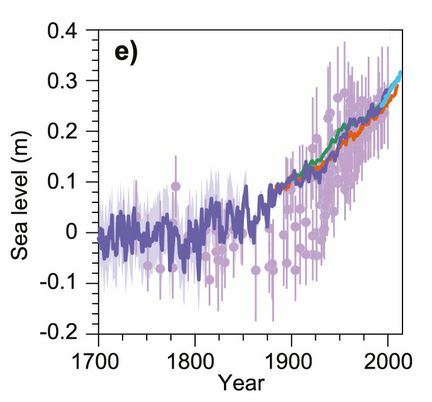 The world has been warming since the early 19th century, and the the average sea level has been rising since the late 19th century. Global warming will accelerate this, a little or a lot — depending on the amount of warming during the 21st century. Here we look at this creeping danger. It’s a slow threat, but one we can prepare for. The paleoclimate data from salt marshes (purple symbols). GMSL reconstructed from tide gauges by three different approaches: orange from Church and White (2011), blue from Jevrejeva et al. (2008), green from Ray and Douglas (2011). Interpretation of Satellite Oceanographic (AVISO), Commonwealth Scientific and Industrial Research Organisation (CSIRO). All paleo data were shifted by mean of 1700–1850 derived from the Sand Point, North Carolina data. The Jevrejeva et al. (2008) tide gauge data were shifted by their mean for 1700–1850; other two tide gauge data sets were shifted by the same amount. The altimeter time series has been shifted vertically upwards so that their mean value over the 1993–2007 period aligns with the mean value of the average of all three tide gauge time series over the same period. 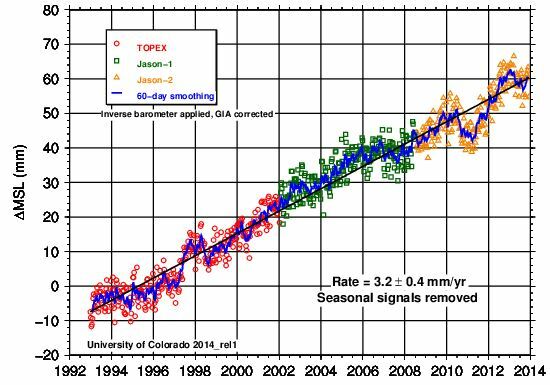 Here is the Global Mean Sea Level Time Series (seasonal signals removed) from the University of Colorado Sea Level Research Group, showing the smallest rate of sea level rise we can expect. Since 1993, measurements from the TOPEX and Jason series of satellite radar altimeters have allowed estimates of global mean sea level. These measurements are continuously calibrated against a network of tide gauges. When seasonal and other variations are subtracted, they allow estimation of the global mean sea level rate. 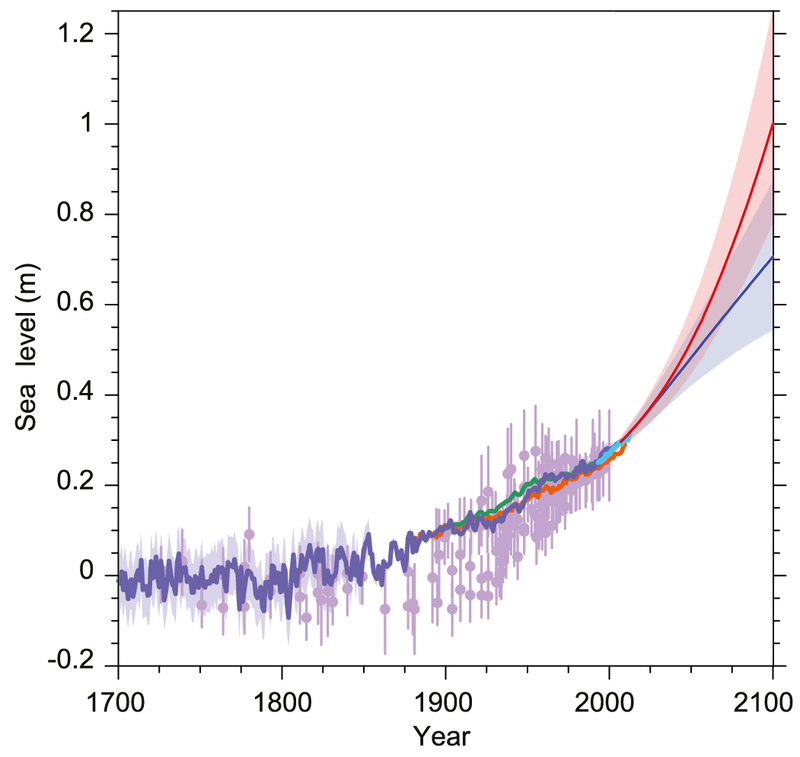 Figure 13.27: Compilation of paleo sea level data, tide gauge data, altimeter data (from Figure 13.3), and central estimates and likely ranges for projections of global mean sea level rise for RCP2.6 (blue) and RC8.5 (red) scenarios (Section 13.5.1), all relative to pre-industrial values. Some people are working to prepare for the future. They deserve our attention and support. Presentations at the UK-US Workshop on Climate Science Needed to Support Robust Adaptation Decisions, 6 – 7 February 2014 — This Workshop addresses the recognized gap between what science is currently providing in terms of information about climate variability and change and the information desired by decision makers. Previous Post Will we see the end of snow? More importantly, when will we learn to see the world clearly? Next Post Four views of exciting new climate research. See the difference.